Take nine exhausted end-of-term science teachers, some radioactive sources, a few bags of Skittles, some play-dough and mix in a few dodgy sporting analogies – and you have all the ingredients needed for a successful Physics Partners training session! We started with some true/false statements to break the ice and tease out some themes. This led to a discussion of students’ confusion between contamination and irradiation. We talked about our moral duty to equip students with a sensible balanced view of radiation risk: neither gung-ho carelessness nor irrational panic. Straight on to atomic structure with play-dough – a great opportunity to recap this section of the course and introduce nucleon and proton number: essential if students are to write balanced nuclear equations (which give easy but often-missed marks in exams). Red protons, green neutrons and blue electrons. What are isotopes? What does an alpha particle look like? What’s going on in beta decay? Then the technician fetched the radioactive sources and, after some tips and coaching on handling sources, the less experienced teachers had a go at measuring the range of alpha, beta and gamma sources, and testing absorbers. We talked about the ionizing power of the three types of radioactivity and how it relates to range, which led to our bowling alley analogy: the atoms of the medium as the skittles; alpha as a slow, heavy bowling ball, beta as a faster golf ball and gamma as a bullet. A field trip perhaps?! And finally we turned to half-life and did the wonderful Skittles experiment. This is the confectionery variety, not the bowling variety. They represent unstable atoms. One small bag is perfect between two people. Tip them out into a tray and pick out all those that come out with the “S” on top – these are the nuclei which have decayed. 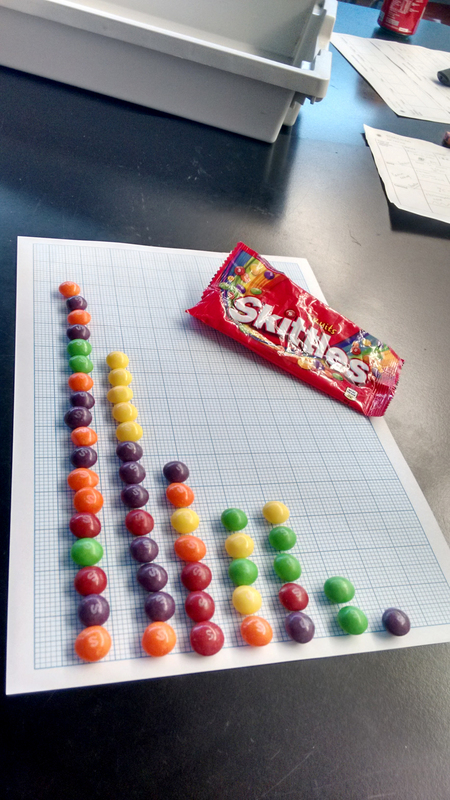 Line them up on some graph paper, and repeat the process with the left-over Skittles. All managed to make a fantastic exponential decay curve, showing a ‘half-life’ of one throw, which tallies with the 50% probability of a Skittle coming up “S” uppermost. Then we ate them! Best of all was that during this fun, relaxing activity, we were able to discuss how we introduce our students to the terms unstable and random (a popcorn machine is useful here!) and looked at what actually causes radioactive decay, throwing in a bit of unfamiliar A level physics on the nuclear belt of stability. As always in my training sessions I learned just as much as the teachers I was training, picking up ideas and models which I will use in future. The Vice-Principal walked in just as we were gorging ourselves on Skittles (oops) – but I hope to return soon to do a session on numeracy.